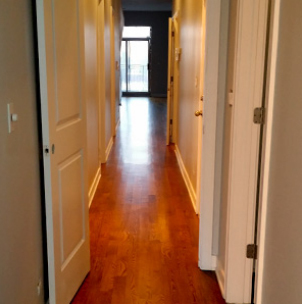 Chicago Flooring - Best Discount Hardwood,Laminate Cost Near Me. 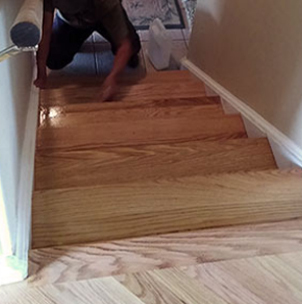 Chicago Flooring - Best Discount Hardwood,Laminate Cost Near Me. 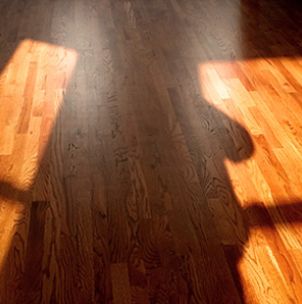 Classic Floors Chicago offers an excellent professional service, with 16 years of experience in the Chicagoland area. 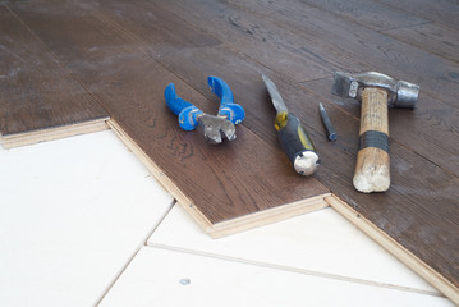 We offer a large selection of services that include: installation of new wood floors, floor sanding, refinishing, floating floors install & old wood floor restoring. Red Oak has a generally even grain. Because it grows slowly, oak is notable for having many growth rings on each board. 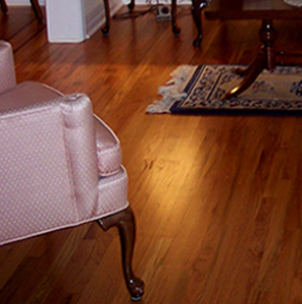 Oak hardwood floors wear well and look their best when properly refinished. 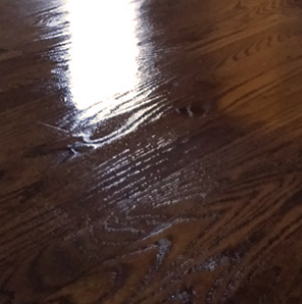 Bring back charm and elegance to your home by adding luster and shine to your oak hardwood floors. 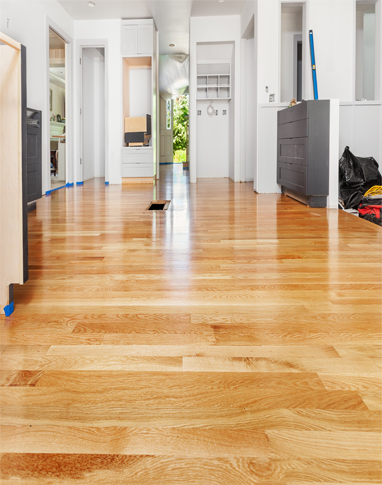 Refinishing hardwood floors is not a task you should do to often. Refinishing a hardwood floor can also cost a significant amount of money, therefore when it’s done, it should be done by professionals. 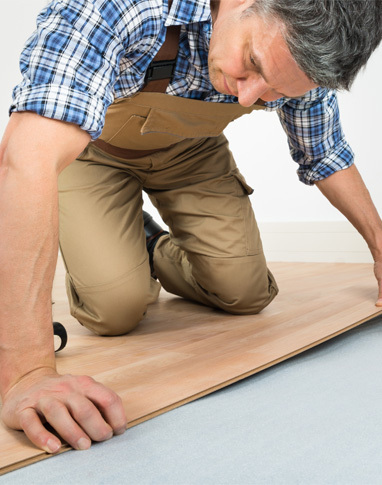 Prefinished, engineered wood flooring is an affordable DIY alternative to the traditional sanded and finished solid wood floor. 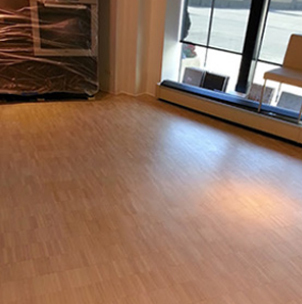 In this job fron Arlington Heights – Illinois we had to resand the existing red oak floor and finish it in waterbase clear coating. A complex job that required full resanding and repairs due to removing of a wall. 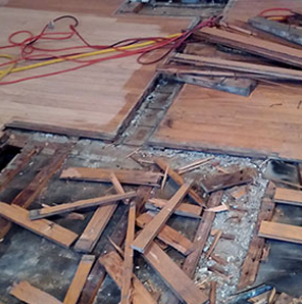 The old damaged floor represented a real challenge for our team. High contrast between white walls and black or dark ebony stained floors and stairs, creates an eye-opening environment. It’s a nice tool for creating a fresh, luxuriant ‘pop’-y, bold environment. Our quality and price will blow away any competitor. 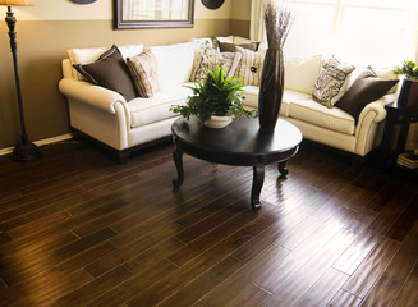 For practical and aesthetic reasons, hardwood comes out on top as one of the best types of flooring you can buy. It adds warmth and vitality to your home and can be customised to match any interior design scheme, whether you’re a fan of contemporary minimalism or you love collecting antique furniture. It’s also durable and incredibly long-lasting. 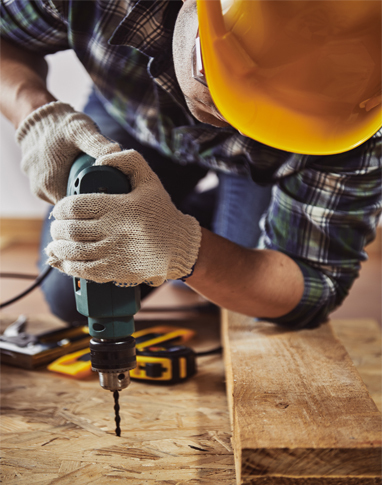 Provided you care for it appropriately, your hardwood floor could last up to 250 years, so it’s a real investment for the future and could add substantial value to your property. What’s more, hardwood flooring has health benefits (since it doesn’t hold on to dust mites and common allergens in the way that carpets do) as well as environmental benefits, being a naturally sustainable material. 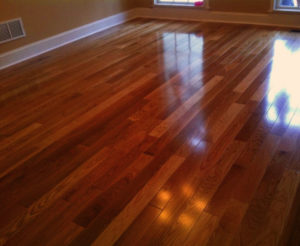 Best Hardwood Flooring Services in Chicago and Surrounding Areas. 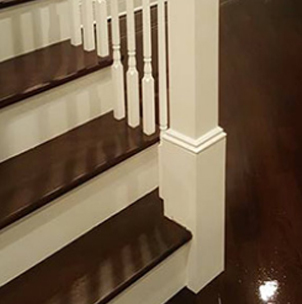 At CLASSIC FLOORS CHICAGO we have more than 16 years experience in install, restore and sand various types of hardwood floors. We are proud of our skilled employees who have a broad level of knowledge. Nevertheless, we still strive to continue improving our competence and do our best to share this knowledge with colleagues and customers. Know-how is an obligation! 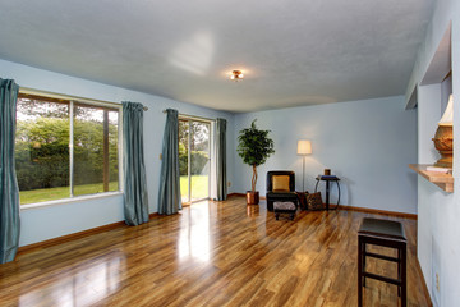 We provide the best Hardwood Flooring Services in Chicago, Schaumburg, Oak Lawn, Palatine, Evanston, Carol Stream, Hoffman Estates, Bedford Park, Melrose Park, Oak Park, Des Plaines, Bensenville, Downers Grove, Arlington Heights, Hinsdale, Glendale Heights, Wheaton, Northbrook, Glenview, Bloomingdale, Elk Grove Village, Maywood, Hillside, Glen Ellyn, Wood Dale, Skokie, River Forest, Wheeling, Glencoe, Alsip, Rolling Meadows, Justice, Forest Park, Hometown, Willow Springs, Clarendon Hills, Summit Argo, La Grange Park, Woodridge, Hickory Hills, Bridgeview, Naperville, Riverside, Park Ridge, Techny, Western Springs, Stone Park, Westmont, Prospect Heights, Hanover Park, Morton Grove, Addison, La Grange, Willowbrook, Blue Island, Deerfield, Winnetka, Lombard, Elmwood Park, Palos Hills, Chicago Ridge, Palos Heights, Kenilworth, Lisle, Robbins, Worth, Buffalo Grove, Highland Park, Medinah, Berwyn, Evergreen Park, Itasca, Golf, Westchester, Bartlett, River Grove, Burbank, Palos Park, Cicero, Bellwood, Winfield, Lincolnshire, Darien, Highwood, Wilmette, Berkeley, Brookfield, Franklin Park, Hines, Villa Park, Mount Prospect, Elmhurst, Roselle, Niles, Lyons and many more areas.